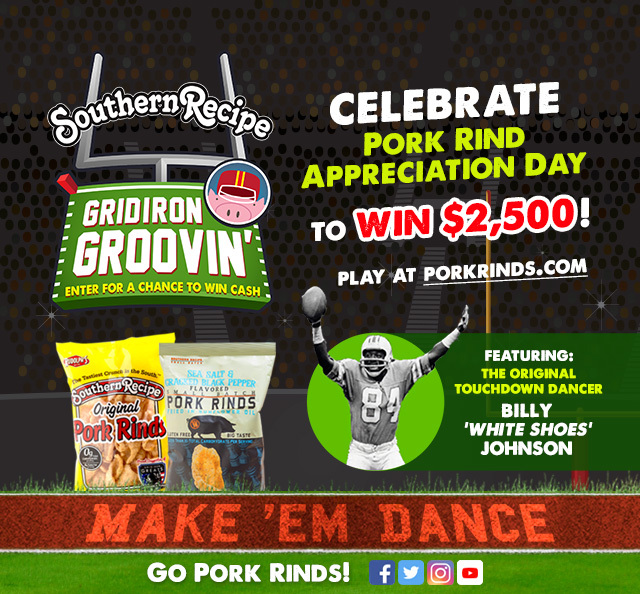 Rudolph Foods, the world’s largest manufacturer of pork rinds, has announced its seventh annual Pork Rind Appreciation Day campaign in partnership with the Gridiron Greats Assistance Fund. Celebrated on the biggest football day of the year, Super Bowl Sunday, Pork Rind Appreciation Day was cemented as an annual event after Rudolph Foods secured hundreds of thousands of consumer votes, as well as political designations, in 2010. Matched each year with a charitable endeavor, Rudolph Foods will again support the Gridiron Greats Assistance Fund, a nonprofit organization that provides medical and financial assistance to former National Football League (NFL) players in dire need. 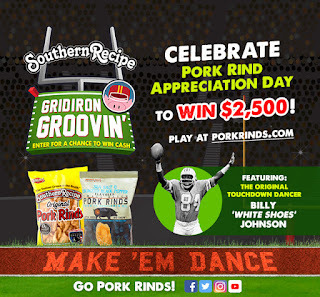 Rudolph Foods has also partnered with Billy “White Shoes” Johnson in order to engage football fans and pork rind lovers nationwide through this year’s Pork Rind Appreciation Day-inspired contest. 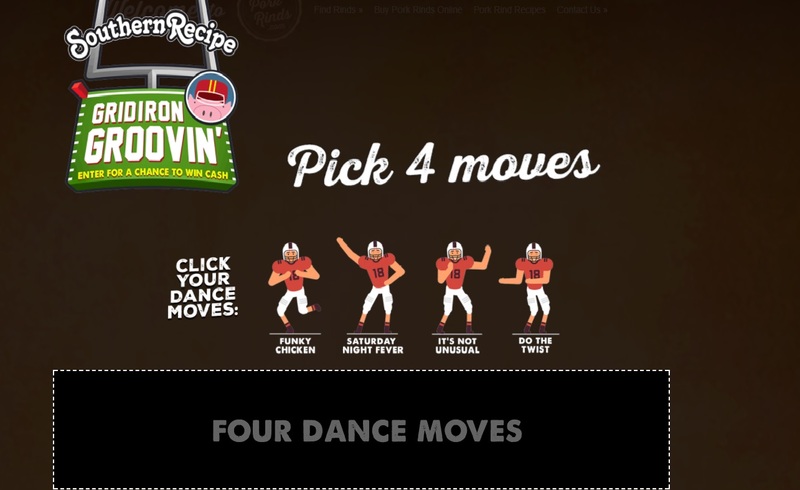 Now through the “big game” on February 4th, 2017, fans are invited to play Gridiron Groovin’, a touchdown dance-inspired game, at PorkRinds.com. There, they will be invited to select various dance moves to create the ultimate end zone dance, a tradition that is always popular with players and fans. This year, Rudolph Foods will join in celebrating the end zone entertainment as well. 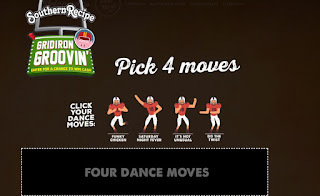 Visitors can play Gridiron Groovin’ as many times as they would like. To give fans added incentive, each successful gameplay enters the fan into a group whereby one lucky winner, selected at random, will win $2,500 and a year’s supply of pork rinds from Southern Recipe. Four runners-up will also win $500 and free pork rinds. A portion of the sale of each purchase of all Rudolph Foods’ products during the Pork Rind Appreciation Day season, including Southern Recipe, Southern Recipe Small Batch, Pepe’s Snacks and Lee’s Pig Skins, will also support the Gridiron Greats Assistance Fund (up to $15,000).